Cockroaches are a fimiliar pest that most properties within Sydney NSW have experienced at one point or another. St George Pest Control offers a professional service when handling the job of eradicating cockroaches from your home or place of business. 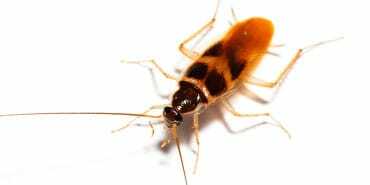 There are 6 main species of cockroaches in Sydney, those are the German Cockroach, American Cockroach, Australian Cockroach, Smokey Brown Cockroach and Brown Banded Cockroach. Cockroaches are a nuisance and spread all kinds of harmful bacteria that can harm humans. They also can ruin a business' reputation, evidence of cockroach infestations can turn customers away and potentially result in closure of your business by Health Inspectors. St George Pest Control can safely and quickly eradicate a cockroach infestation. Contact us now to discuss the removal of cockroaches from your home or property. Sight of a Cockroach - Cockroaches are nocturnal, so seeing one during the day is a possible sign of infestation. Cockroach feces - Feces often rsemble coffe grounds or black pepper, sometimes in larger cockroaches they are more cylindar like. A good indicator of the level of infestation is the quantity of visible feces. Unpleasent Smells - Some species of cockroaches emit bad smells, when a serious infestation occurs a strong oily odor may be present. Oval-shaped eggs - Sometimes visable near furniture or other locations that are hard to reach. Keeping areas clean and tidy - It is important to clean all surfaces in your home and business. Removing any food scraps or garbage. Try not to leave dirty dishes in the sink and keeping bins covered and clean can improve your chances of not having a cockroach infestation. Cockroaches love warm areas especially where food can collect so keeping the top and bottom of your refrigerator clean is important. Sealing Gaps and Fixing Leaks - Sealing gaps around doors, windows and any other places of entry for small pests, its essential. Repair any leaks as cockroaches love to have a water source.